When I make this face, you know something is amiss. Bummer: a two-player game. But that means I just get to write really large! Two-player situations are always straightforward. Catherine should wager 8,000 to cover Joann. 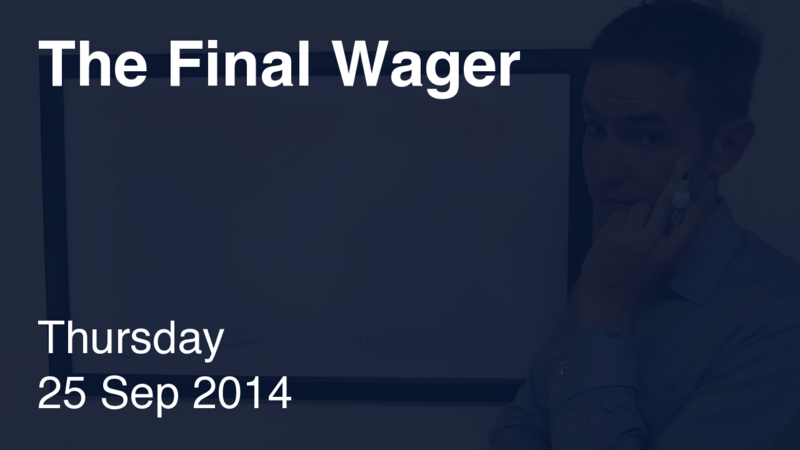 Catherine might consider a smaller wager: up to 7,200. If she’s scared of this possibility, Joann should wager everything. Ugh. Fie on both of these wagers! Catherine: If you’re not going to go for the lockout, don’t fall below a zero wager by the trailer! Joann: It’s not like you’ll finish in third place – if you’re going to go big, go big! Who was Josip Broz Tito?